Athletes are being urged to take up interests outside their sport to potentially enhance their performance in competition by a new campaign. Double Olympic champion Lizzy Yarnold is among a group of athletes backing the #More2Me campaign. The initiative calls on athletes to develop a "more-rounded identity" and consider their life both outside and after sport. 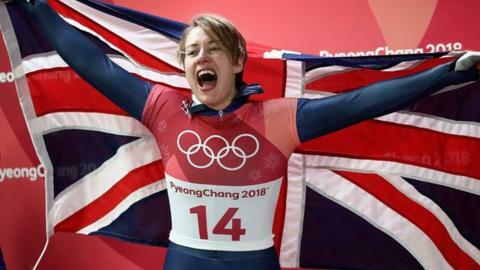 Yarnold claims non-sporting interests were "major reasons" for her success. "I felt that having a life outside of sport and doing things like being involved in education or pursuing hobbies helped me to relax into being an athlete and had a positive impact on my performance," said the 2014 and 2018 Olympic skeleton champion, who retired in October. A 2018 BBC Sport study found one in two former athletes said they did not feel in control of their lives within two years of finishing their careers. Respondents told the BBC they "lose their identity" when they finish playing sport, experiencing "loss", "regret" and "devastation". But by developing interests and skills outside of their sport now, the campaign says athletes can help to better prepare themselves for retirement. Yarnold is joined by five-time Paralympic gold medallist Hannah Cockroft, retired gymnast Kristian Thomas and 2018 World Judo Championships silver medallist Nekoda Smythe-Davis in backing the initiative. Minister for Sport Mims Davies is also backing the campaign and said she hopes it prevents athletes from being "left feeling isolated" after retirement. Research conducted at Abertay University in Dundee focusing on Australasia's National Rugby League has found that career transition planning had a positive impact on performance on the field and on the length of a player's career. The English Institute of Sport head of performance lifestyle, Joanna Harrison, said: "There is a large amount of anecdotal experience but having this demonstrated through scientific data for the first time is very impactful and has significant implications for elite sport. "It shows that athletes who have interests outside of sport and plan for their retirement whilst they are still competing can perform better and be retained for longer." The English Institute of Sport will offer personalised support to athletes as part of the initiative and will seek to offer personal and career development opportunities, as well as support to those transitioning out of sport.